Break the dreaded Trek Movie Curse!!!! Can I do it???? Do Tribbles purr? Do Klingons growl? Do Vulcans polka???? Actually, I am not sure about that last one. But I don know I am going to give it my best Starfleet try! As movie legend goes, all even numbered Trek movies are Good and all odd numbered Trek movies are Bad! Hopefully, after watching this edit of Star Trek III, you will think differently. While THE SEARCH FOR SPOCK is my personal favorite of the Original Cast Movies, even I admit the story suffers in terms of pace and structure. So with this edit, I have completely re-sequenced the order of all the scenes in the first 2/3′s of the movie. Saavik’s quest for Spock is now moved to the forefront (it is after all called “The Search for Spock”!!!!) and runs parallel to Kirk’s discovery of Spock’s Katra and theft of the Enterprise. Also to tighten the plot and increase the pace of the movie, most of the support cast gags have been trimmed or completely removed. By doing this, I think I have created a more linear and entertaining adventure. SYNOPSIS: LOYALTY. FRIENDSHIP. SACRIFICE. Never have those words meant more for the Enterprise crew than now. 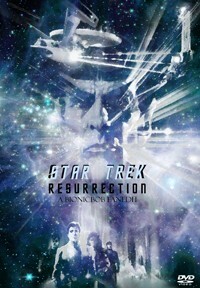 Kirk and his crew risk their lives and Starfleet careers, as they race against time to reunite Spock’s body and soul. In this third entry of BionicBob’s TOS Movie Cuts, The Search for Spock has been boldly restructured into a leaner, faster-paced, more plot driven adventure! I'm going to keep this one short. This was an excellent edit of a really bad movie. In fact, I had forgotten entirely how bad this movie was! And it looks really cheap too (not this edit, but the movie itself). This is the perfect movie for the make-it-seem-like-the-tv-show format, because it feels like a tv movie. The captain of the ship orbiting the Genesis planet especially seemed like a guy who might have failed an audition to be on one of the Trek spinoffs. And Reverend Jim Romulan was laughable as well. I think Bionic Bob made this terrible movie as good as it could be. I know a lot of people have issues with the aspect ratio or screen size, but I watch these on VLC media player on the laptop, through a hdmi wire to a big flat screen tv, and set on overscan. It looks perfect to me--like a hi-def letterboxed movie. No complaints about the picture here. Bob doesn’t fully resurrect Star Trek 3 but it’s a heck of a lot better. Another enjoyable Bionically Enhanced Trek movie! A great edit making a very mediocre “phoned-in” performance movie watchable. The original movie is #2 of my most loathed Trek movies (ST V being #1 and ST IX tying with ST V) and Bob made it watchable for me. This is another great turn in his trek series and Bob does his best to make it work. 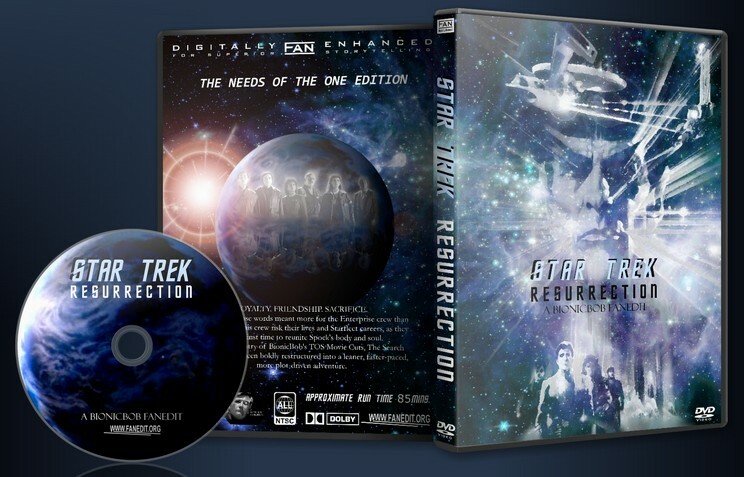 I simply loved the re-ordering of the two story lines – the movie as a whole is now so much more exciting and comprehensible and really shows how determined Kirk and crew are to get Spock. I would have to say, in my humble newbie opinion, that there is just no other way to make some of the other characters (namely the Capts) any better. Bob does his best, but they are just too weak to really do much. and…THANK you for removing the Bones earthbound sub-plot. I have always thought it was just too silly and poorly written to ever work for me. Like L8wrtr, I will only watch this version of ST 3, never will I reach for the original again. I hate to echo L8wrtr, but he made a very good point about BionicBob’s series: he has run the gamut of FE for me too. This is such an improvement on the original that I don’t have the words. Every bit of goofiness has been removed, and it didn’t suffer for it. I personally would’ve like to have seen David’s final scene, but the way it was handled made it more suspenseful.